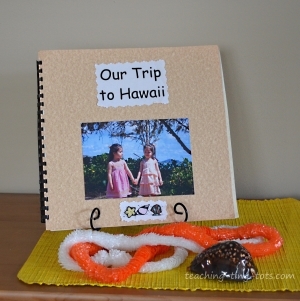 Toddler Books: Making Your Own Books is a Surefire Way to Capture Your Child's Attention. There is something special about seeing pictures of him or herself and favorite family members, friends and pets that will make "picture" books one of their favorites to read. 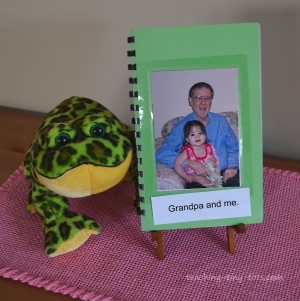 Our first photo book was made at about 18 months and is shown in the picture. We have had many book repairs since but they still enjoy seeing photos of themselves when they were babies. The topic selected was family since it was simple and a great way to help remember names of family members. Photo paper or xerox paper to print the pictures on. Clear Contact Paper or Laminating Sheets to protect pictures. Select Pictures to be used and print on xerox or photo paper. 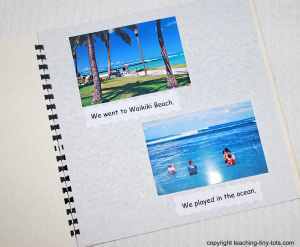 With your child arrange pictures in order to be glued on pages. Have your child try to identify the person. 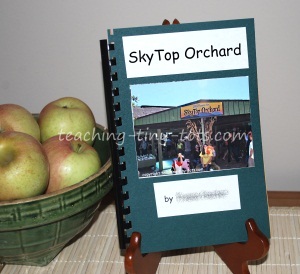 Write legibly under each picture or print out the names for your book and use glue stick to adhere. If you are using pictures printed on photo paper you might want to cover them with clear contact paper especially for younger children. Place all names under pictures to keep it uniform and easier for child to know which belongs to which picture. Have your child find the picture to match the name. Point to the name when you "read" the book together. Take pictures when you are on vacation or on a trip of all the things you do and put together a book highlighting the best events. Have your child place the pictures in chronological order if they can or name the activity and see if they can find it. Arrange the pictures on the page. Have your child say a simple sentence to go with the picture. Print or write the sentences on strips of paper. Read the sentence and have your child find the correct picture. Point to the words as you read the book together. Have your child read along with you. Be sure to praise them for "reading"! Point out details in the pictures as you share the book together. This will help reinforce the use of picture clues which is an important basic reading skill. This is a great idea for any family outing. Take pictures of things they did, in this case picking apples, drinking apple cider, eating apple donuts and playing among the pumpkins. When you share the book together, point to the word and say the name. Make sure to praise your child for "reading" if they can tell you anything about the photo. Picture clues are an important reading strategy for toddler books.